In your recent episode about gingipains and Alzheimer’s disease (episode 195), Michael pointed out that in the context of human health, neurological infections of HSV1, in addition to the episode focus of Porphyromonas family bacteria, can both be causes of AD. He suggested a possible future polytherapy of acyclovir and COR388, which could be used to treat or prevent AD. Even valacyclovir, a more realistic option, would require patients to take it up to 3 times a day for full suppressive activity. Maybe at some point, we’ll have something even better than that. Anyway, thank you for putting out such consistently fascinating podcast episodes. They are engaging in a way that frequently leaves me feeling hopeful about my own (aspirant) field, medicine. Thanks for your podcasts. I would like to ask Dr. Schmidt why he repeats that flossing is helpful. Wikipedia and a quick search at pubmed did not show me any evidence. 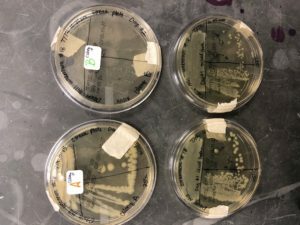 I truly enjoy learning about Microbiology, I only wish that I had realized my passion for microbes at minimum a decade sooner. After earning my graduate degree in Curriculum Development and working as an educator in teaching English to non-native speakers for almost 10 years; I am now a student again. I endeavor to become a nurse and eventually a nurse practitioner with a focus in Gerontology. In addition to being a student, I also coach Women’s Competitive Gymnastics as well as instruct Adaptive Gymnastics classes for children. My class is full of amazing individuals ranging from 7-15 years of age. The majority of the class has Autism ranging from non-verbal to high functioning. In the future, I am keenly interested in doing research. I am particularly interested in both Autism Spectrum Disorder and Neurodegeneration and the role that microbes play in both of these processes. From the very moment I hear your voices my heart swells with joy. I feel as if I’m hearing from an old friend. I am so grateful for all that you do, your enthusiasm, tenacity, work and productions. I just want to say THANK YOU! Here are a few photos so this I ant just another boring email. I hope you enjoy. My Unknowns project is one of my greatest accomplishments as is the dichotomous key which I created. 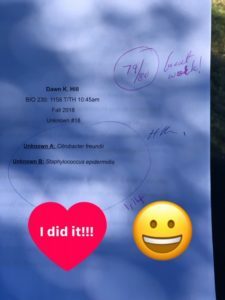 I had a profoundly inspiring but rigorous professor for my Micro class and I can honestly say that I literally put blood, sweat and tears into that experience. Please keep doing what you do, you truly make a difference in the lives of so many people!